In their 48th year, Magma shows no signs of slowing down. Touring extensively in 2015 and 2016, Christian Vander continues to lead an energetic ensemble of new and old members. The music of Magma is perhaps indescribably unique, consisting of a combination of symphonic rock, artistic chant, creative jazz, and minimalism. This 2-hour DVD release is notable because it features full versions of two of their more recently-released album-length suites: K.A. (Kohntarkosz Anteria) and Emehntehtt-Re. While both pieces trace their compositional lineage to the 70’s, studio recordings were first released in 2004 and 2009, respectively. Recorded during their 2014 campaign, Magma’s performers are Stella Vander on vocals and percussion, Isabelle Feuillebois on vocals, Hervé Aknin on vocals, Benoît Alziary on vibraphone, James MacGaw on guitar, Bruno Ruder on keyboards, Philippe Bussonnet on bass, and of course Christian Vander on drums. The trilogy consists of three pieces, the aforementioned K.A. and Emehntehtt-Re, with Kohntarkosz sandwiched between. All three are of epic length, each an entire album’s worth of music. The DVD begins with the first ever officially-released live recording of K.A. Magma succeed in capturing the aggression, complexity, and subtle beauty of the piece. K.A. I and K.A. II are both vocal-heavy, with the latter featuring powerful call-and-response parts. K.A. III offers a more overt prog-rock approach, with a long keyboard-led instrumental break. Despite this performance having two fewer vocalists than the studio version, Stella Vander, Aknin, and Feuillebois capture the spirit and fullness of the original. Additionally, the contributions from MacGaw and Bussonnet go beyond the text of the piece, so to speak, providing accentuating lines and solos. The result is a brilliant rendition of one of Magma’s strongest compositions. Kohntarkosz, the second offering, is a well-worn piece, performed by Magma for over 40 years. There are many versions thereof, but perhaps the classic rendition is from the 1975 Live/Hhaï recording. So much has been written about Kohntarkosz over the years, especially its combination of harshness and delicacy. Here, the guitar takes a lead role that was traditionally performed by a horn section. Overall, this version is a smoother and more polished Kohntarkosz than those of the past. The vocals, in particular, are both lilting and dark, exhibiting precision that results from heavy touring. Whether that adds or detracts from the experience depends on your take on Magma. The definitive live version of Kohntarkosz? Maybe, maybe not, but a very good one. Emehntehtt-Re is a deceptively complex piece, especially the beginning of Part II, where three vocal lines combine into a main movement. I have listened to the studio recording literally dozens of times, which has perhaps given me certain expectations about how this section should sound. On the studio version, it contains a very powerful and full anthemic theme. Here, the tempo is slower at first, the pacing is slightly different, and it doesn’t have the immediate punch of the studio version. However, as the piece goes on it picks up steam. By the time Magma reaches the Zombies section (Emehntehtt-Re contains a reworking of that Udu Wudu track), they are plowing along in archetypical Zeuhl fashion. 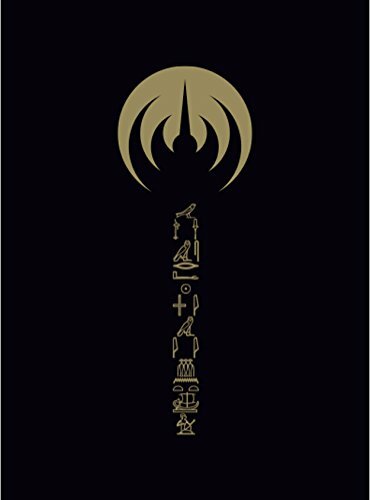 Simply put, Emehntehtt-Re Trilogie is a must for Magma fans, especially those of the direction the band has taken in the last two decades. And in case you didn’t figure it out yet, I’ve written this review solely based on the music on this DVD. The video? I’ll save that for another day. On March 6, Richmond VA-based WaBEYA will appear at Arlington’s iconic Galaxy Hut, sharing the bill with the Lost Civilizations experimental music project, augmented for this evening by Douglas Kallmeyer (bass & electronics), Patrick Whitehead (Flügelhorn and trumpet) and master percussionist Larry Gomez. WaBEYA is a dark ambient r&b project of Singer/Producer Mishika Tshishimbi. The Lost Civilizations experimental music project is a collaboration between Mike Sebastian (Tenor Sax, Saxello and Bass Clarinet) and T. A. Zook (BassCello and Misc. Instruments). Although it is essentially a duo, it often features guest performers. When complex schedules permit, it now performs with Doug Kallmeyer on bass and electronics; Jerry Busher on percussion and electronics; Patrick Whitehead on flügelhorn and trumpet; Sam Lohman on drums; master percussionist Larry Gomez; Leah Gage on drums; Bob Boilen on ARP synthesizer and Emily Chimiak on violin. This project began performing in 2008. The project’s performances are unscored, unrehearsed and improvised extemporaneously on the spot. Galaxy Hut is located at 2711 Wilson Boulevard, Arlington Virginia. The performance begins at 9pm; there’s a $5 cover charge (all of which goes to the musicians); the venue is 21+. The sixth CD by Zorn’s heaviest 21st century ensemble Simulacrum celebrates the 500th anniversary of the passing of one of the greatest painters the world has ever known—Hieronymus Bosch. A visionary of unparalleled power whose imagination and fantastical creations re- main uniquely his own, Bosch is one of the most enigmatic figures in world art. Inspired by his surreal visions of Heaven and Hell, “The Garden of Earthly Delights” blends heavy metal, blues, funk, jazz and modern classical music together into one of the strangest amalgams you’ve ever heard. Tighter than ever and joined by bassist Trevor Dunn, Medeski, Hollenberg and Grohowski are at their manic best in this jaw-dropping visit to a wild musical world where absolutely anything is possible! Drawing on his vast experience as viola player of the Arditti Quartet, Ensemble InterContemporain and his close collaboration with many of the today’s leading composers, Garth Knox has become a master of many styles. Presenting a completely new interpretation of the “Book of Angels”, the beautiful medieval-tinged arrangements produced by Garth Knox and his group capture the folk song quality of Zorn’s compositions with a lovely and intimate ensemble of strings and percussion. Playing viola and viola d’amore, Garth presents these enigmatic compositions in a new and refreshing light. This penultimate installment of the “Book of Angels” is also one of the most charmingly beautiful. The program includes the New York premiere of Triple Concerto for Violin, Cello, Bayan, and Orchestra by Russian composer Sofia Gubaidulina, co-commissioned by Carnegie Hall for its 125 Commissions Project and featuring guest soloists Baiba Skride (violin), Harriet Krijgh (cello), and Elsbeth Moser (bayan). The work is performed alongside Shostakovich’s “Leningrad” Symphony. Roulette presents Dance That Empties, a newly commissioned long-form composition from tenor saxophonist Travis Laplante. The evening will also feature Laplante’s saxophone quartet Battle Trance performing the album-length composition Blade of Love. Miller Theatre features composer Misato Mochizuki in this composer portrait, featuring performances by Yarn/Wire and JACK Quartet. Focused on the music of our time, this program pairs works of world composers/performers Nico Muhly, Nadia Sirota, Caroline Shaw, and Andy Akiho with pieces by the winners of PUBLIQuartet’s national emerging composers competition, PUBLIQ Access. The six-concert festival will launch at The Cutting Room, with the CompCord Big Band premiering 10 compositions. Composers will include Kinan Azmeh, as well as Dan Cooper, John Clark, Anthony Branker, Joseph Martin Waters, and others. For her third and final performance as a 2016 Artist-In-Residence, Leila Bordreuil premieres Void and Dismissal — a collaborative piece developed by Bordreuil and composer, guitarist and vocalist Austin Julian (Sediment Club, Sunk Heaven). Featuring Tamio Shiraishi (alto sax) and Julia Santoli (spatialized amplifiers), the piece combines music and performance art within an operatic structure using homemade instruments and creative amplification methods. This concert features Levy Lorenzo, Monte Weber, Dennis Sullivan, Viola Yip, and electronics OpenICE students with composer Monte Weber. Assaf Gidron, Teodora Stepančić, and Elliot Simpson perform music by Larry Polansky, Alvin Lucier, Samuel Vriezen, and Manfred Werder. Don Byron, Blair McMillen, Cornelius Dufallo, and Wendy Sutter join forces to premiere new works for quartet by Don Byron and works by Anton Webern, Erik Satie and Olivier Messiaen. This concert features solo sets by Nuiko Wadden and Gareth Flowers. This concert features solo sets by Alice Teyssier and Ryan Muncy.